Making Waste Visible to Employees – CMC gave training classes to all operators and middle managers, to ensure they could recognize waste in their working environment. The projects led by employee teams, guided by CMC, led to serious savings. Purchasing & Planning Policy — New rules in purchasing, planning, and inventory control were set in place. The factory moved toward JIT procurement and production. New Production Organization — CMC streamlined inefficient production flows that were generating enormous waste in time and money. In addition, CMC consultants prepared new jigs and fixtures while implementing more balanced production lines. New HR policy — CMC applied an incentive scheme based on teamwork that allowed the factory to avoid the pitfalls of piecework while keeping the operators motivated. 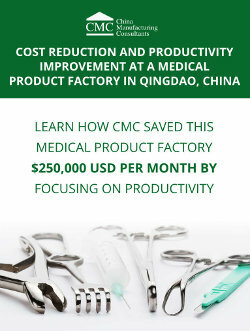 In six months, CMC improved the factory’s cash position by 3,450,000 RMB. On-time shipments increased from 39% to 65%, rework costs were divided by 8, scrap rate was reduced by 30%, and 100 fewer operators were required (for a similar production volume).